Content is king! Content rules! Yeah, we know that already. Thanks to the burgeoning growth of content marketing – the new “silver bullet” in a marketer’s arsenal – everybody is hopping onto the content marketing bandwagon. However, how do we tap this rising trend? More specifically, what should you do to “create killer blogs, podcasts, videos, e-books, webinars (and more) that engage customers and ignite your business”? 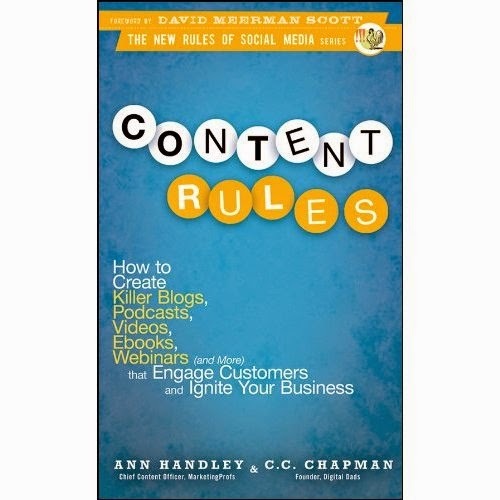 Enter Content Rules by content and social media marketing savants Ann Handley and C.C. Chapman. Part of the New Rules of Social Media edited by legendary David Meerman Scott, Content Rules teaches you how to create compelling online content that attracts customers, build communities, generates leads, and grows businesses. The book is divided into three parts. Part 1 focuses on the Content Rules themselves, part 2 covers a “How-To” section, while part 3 narrates successful case studies of organisations which have successfully embraced content marketing. They include the U.S. Army, HubSpot, Boeing and PinkStinks. In the social and digital age, the barriers of entry to publishing have been virtually obliterated. We can now reach our potential buyers directly by publishing via blogs, videos, podcasts, forums, wikis, e-Books, and posts on social networks with relatively little cost. Dig deep to create your brand story, give voice to your unique point of view, and know your customers. What keeps them up at night? What do they truly care about? Ensure that whatever you create is authentic, believable, and valuable. Be clear on what your objectives are. Gather momentum as you create your content pieces while you stick to your intent, incorporate a psychological trigger, and end off with a Call To Action (CTA). Do not write like a cold, bloodless machine. Instead, communicate your brand story, values, and mission in the language of your customer. Write like how you speak in your own unique voice. Enrich your content with lots of personality, empathy and emotion. Create core pillars of content at its inception that can be re-imagined into various formats and served on multiple platforms. For example, your 30 page eBook can be repackaged into multiple blog posts, podcast episodes, videos, infographics, Facebook posts, tweets and more. This is an absolute truth. Good content creates value by sharing a resource, solving a problem, or helping your customers to do their jobs better. You can also publish educational or edu-taining content that helps your prospects to improve the way they lead their lives, inspire them, give them levity or boost their mental and physical health. Remember to keep your sales messages at bay. You should only start selling after you have earned the right to do so from your regular audiences. Avoid preaching or hard-selling. Similarly, don’t overdo the superlative adjectives in your prose. Rather, demonstrate how credible you are through case studies or client stories. Give your prospects real life examples of how your products and services can help your customers. Yes, there’s no business like show business. Surprise and entertainment helps to drive viral sharing while building your company’s personality. This is especially true for B2B companies offering a technical or highly specialised product or service. Good content does not exist in a vacuum. Rather, it is used to spark interaction, conversation and engagement between you and your customers in the social sphere. In this regard, do not try to be comprehensive and cover all the bases. Provide just enough to light your prospect’s fire and continue to fan that flame through regular injections of “fuel”. Ground your content in your own point of view, but ensure that it is findable (tap Search Engine Optimisation or SEO to boost search rankings), accessible (mobile friendly), and shareable on social networks. You should also set up a social media listening dashboard and respond quickly and sincerely to your community. Finally, leverage on what you are strong at rather than aim to create everything and publish everywhere. Focus on that niche of yours and exploit that. From blogs, webinars, white papers and e-Books to FAQs, case studies, photos and videos, the second part of the book highlights the dos and don’ts for each content class. A blog post template that you can instantly adopt. Guidelines to organising “awesome webinars” that helps you to generate customer leads. Understand the differences and similarities between white papers and e-books. How you can create customer success stories. What you can do to craft impactful and sales-oriented FAQs. How you can develop a content editorial calendar, complete with suggested frequencies of different content formats and types. As a bonus to readers (and you too, as my book review reader), you can download this convenient 12-point content rules checklist here. My favourite section of the book is probably the third one focusing on customer success stories. Here, we uncover how different companies navigate their own content marketing journeys and learn from both their successes and failures. Do you know that Indium – a supplier of industrial alloys and solders used in electronics – has 73 highly specialised blogs aimed at specific SEO keywords? Or that the US Army allows servicemen and women to blog freely (subject to security conditions) from the front lines of war zones like Iraq or Afghanistan? Insights from these world leading organisations help to flesh out the frameworks presented in the book. The authors also encourage us to “steal ideas” from these case studies and apply them in our own organisations. Minimising the rhetoric commonly found in other social media or content marketing titles, Content Rules dives deeply into the hands-on action of creating great content. I like how the authors weave numerous examples, hints, and case studies into each chapter of the book. These help to “show and not just tell” how content can be created. The best thing about the book, however, is its emphasis on how B2B companies can take advantage of content marketing. In fact, an entire chapter is dedicated to providing steps which B2B companies can use to develop their content strategy. 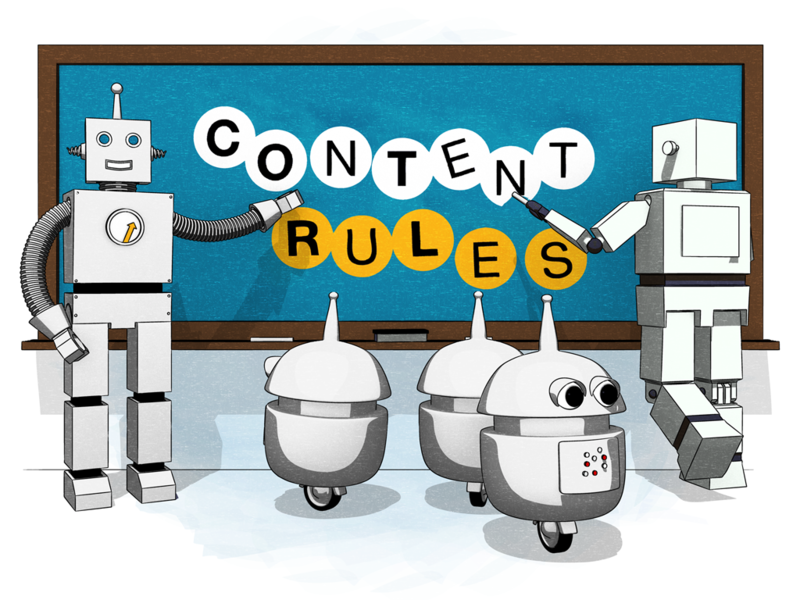 There is a tremendous amount of potential for B2B companies to ride on the content wave, and books like Content Rules certainly help to guide them along. For more information, check out the Content Rules website. Highly recommended! I really enjoyed this one too. Read this quite a while ago. Great review!